Thallus: orbicular to irregular, up to 3 cm in diam. or more when confluent with other thalli, lobes ± imbricate lobes: up to 1.5 mm wide but usually around 1 mm, flat or slightly convex, particularly at tips, eciliate upper surface: gray to dark gray or brownish gray, usually strongly maculate and ± rugose; soredia and isidia lacking upper cortex: paraplectenchymatous medulla: white lower cortex: prosoplectenchymatous lower surface: white to brownish, with white to black, scattered rhizines Apothecia: numerous, up to 1.5 mm across, usually smaller; margin: crenulated when young; disc: brown to black, sometimes covered with a white pruina ascospores: brown, 1-septate, Physcia-type, (15-) 16.5-20 (-21.5) x (6.5-) 7-9.5 (-11) µm Pycnidia: numerous, immersed conidia: subcylindrical, 4-6 x 1 µm Spot tests: upper cortex and medulla K+ yellow, C-, KC-, P+ yellow Secondary metabolites: upper cortex with atranorin; medulla with atranorin, zeorin and occasionally some other triterpenes. Substrate and ecology: growing on rocks in open situations World distribution: known from more northern parts of North America and from Europe Sonoran distribution: a relatively frequent species from coastal regions to upper montane areas in Arizona, southern California, Baja California, Baja California Sur, Chihuahua, Sonora and Sinaloa. 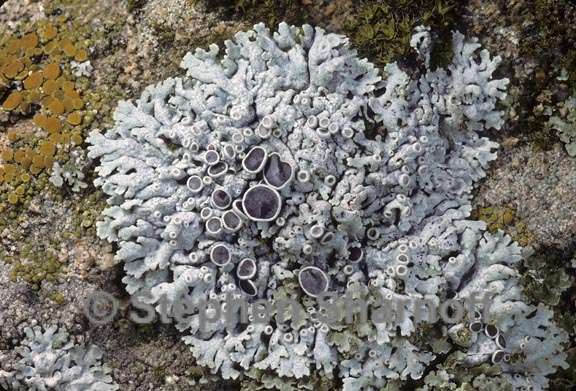 Notes: Physcia phaea is easily recognized by the strong maculation and the rugose upper surface, the abundant apothecia and by the chemistry. The K reaction in the medulla is not a good diagnostic character (see P. nashii and P. neglecta).